The Druids did not have one symbol to represent themselves, but rather, certain symbols are associated with the Druids. Some of these symbols came along at a later time and are not ancient in origin. The Triskele: a rounded spiral with three arms radiating from a central point, turning counter-clockwise. The majority of Druid beliefs occurred in 3. It stands for mind, body, spirit, coming together in a unending cycle. Some believe it to mean sky, earth, and water. The Spiral: Neo-lithic monuments typically have spiral patterns carved into the stones. It is believed they stood for the cycles of seasons, of day and night, and of life and death. The sun appears to move clockwise as it rises in the east and sets in the west; the stars turn in a counter-clockwise as they rotate around Polaris, the pole star. It is possible that spirals represent these astronomical movements. 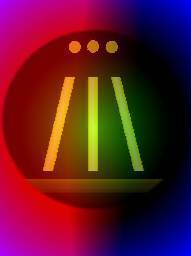 The Awen: /|\ Three upright bars, with the tops of the outer two bars leaning toward the top of the center bar. Sometimes the Awen is draw with three stars within a circle, or just circles above it. The word "Awen" is Welsh for "inspiration". The symbol stands for truth, knowledge, and justice. The Circle: The circle represents a continuous cycle. from birth to life to death to rebirth. It is added on the cross to make a celtic cross, a tribute to druids of days gone by. The Celtic Cross: A Christian Cross with a circle surrounding the middle point where the vertical and horizontal lines of the Cross intersect. The Druid Sigil: A circle intersected by two vertical lines. In Stuart Piggot's book "The Druids", there is a photo of a Romano-British building, possibly a temple, located at Black Holmes, Thistleton, Leicestershire (England) in which this symbol forms the foundation. The Henge of Keltria, a large Druid organization in the United States, uses this symbol. The Horned God An image of a male God with horns on his head, usually stag antlers but sometimes small bull horns. This god is usually referred to as Cernunnos. A male god of earth and the hunt. He is depicted as various animals rolled into one surrounded usually by trees. The 6th Moon: The time between the cresent moon and new moon were said to be the times when the veil to the otherworld were thin and magic would be stronger. The Tree: A primary symbol of Druidism, however, each species of tree known to the Druids had a meaning of its own. The tree is the connection between all elements. It reaches from the earth to meet the sky bringing forth water, yet providing fire and warmth. Half of the tree extends above earth and half below, representing balance. The Head: The Head represents the connection of mind, body, and spirit. To behead would ensure a continued death. Long White Beards: The Druids and all the Druid nation was known for having "wild" hair which flew about them in battle. This included beards and even eyebrows on some. Mistletoe: Mistletoe was considered to be the heal all herb. Particularly potent when collected from the oak at a certain time of the year. Scientists are now finding that "myth" to be very much true. Curved blade, Sickle or Scyth: Pliny, a Roman historian, recorded a Druid ritual in which mistletoe was cut from an oak tree by a Druid in white robes, using a gold sickle. The mistletoe was to be caught in wicker baskets and not allowed to touch the ground. We all have seen the classic picture of a druid in a tree cutting the mistletoe with a sickle while other druids wait below to catch the mistletoe in their white robes. It has been discovered that the mistletoe ritual was indeed based on fact and reasoning. Gold is a metal that seems to be the least offensive in contamination, however it is to soft to cut with, therefore the knife was probably a mix of gold and another metal. Perhaps pyrite (fools gold) or entirely made of brass. It would have been caught prior to touching the ground to prevent contamination. The cresent shaped knife is well known to cut easily and effectively. Druid Rod or Staff: Druids used a staff as a type of conductor for majick. It had to be made of wood, and the type of wood used depended on the type of majick that it would partake in. A metal rod could result in a surge and harm the holder. Gems can be added to the staff to increase its power and reflect it onto the desired course. Similar to a lazer. Bell Branch: This was traditionally a silver tree branch with gold bells attached to it. The sound of the bells is pleasing to the Gods and attracts their attention, while at the same time it is offensive to the ears of malevolent spirits who are driven away. Some stories include a goddess who invites a human into her home by presenting him with a brach with bells, fruit, or blossoms on it. This tool is used by some groups to help draw spirits from the other realm. the bell branch would be known to others as "the golden bough." The golden bough is a branch from the oak tree that has mistletoa attached to it. In the Britain area the mistletoe berries are white, however in other parts of the world, they are yellow. Crane Bag: The Crane bag belonged to Cumhall, father of Fionn Mac Cumhall, which Fionn had to recover when it was stolen. It contained many treasures from such deities as Manannan and Giobhniu, and would be full at high tide and empty at low tide. One of these treasures apparently was additional letters for the Ogham. Modern druids use leather or cloth pouches to hold their most precious tools. Cauldron: The cauldron is a prominent tool used for everything from basic cooking, to making herbal concoctions, to making candles. Dagda and Cerridwen both had majickal cauldrons, and cauldrons are often mentioned in celtic tales. Some were said to bring wisdom to those who drank from it, and another was said to bring the dead back to life. Archaeologists have uncovered several cauldrons and buckets that were ornamented for ritual uses. Animal and plants: The druids believed everything had a purpose and reason, and nothing went to waste, not even the remains of an animal. The uses could be anything from cloths to medicinal or as talisman. Cloths could be made from the skins of animals as well as from feathers. Plants and trees all had a purpose as well, for majick, construction, and healing. The use of sacred plants in paganism was so strong that the Catholic Church forbade the presence of mistletoe and holly in its churches. Musical instruments: Harps, drums and woodwind instruments such as whistle, flutes and pipes are all a part of druid structure. Drums and woodwinds (horns) could be made from animals, and woodwinds from various woods and reeds. Musical instruments are used not only for connections with the spirits but can enchant animals. Stones and gems: Druids primarily gathered in tree groves as the provide protection from the elements while still remaining withing the elements. However stone circles were often used as well. The stone circle is often where mass gatherings occured and ceromonies were performed. The stones acted as a grounding force. With the occurance of majick, a grounding element must always be applied. Gems, metals in the form of stones, and other stonelike objects were often used for their healing and grounding properties. All animals were believed to have meaning and special attributes. However, certain animals are mentioned more than others and hold special symbolism to the Druids. More information on these animals is provided in the animal section. Horses: Horses, especially white horses occur quite frequently in Celtic Mythology. Most often they represent or are attributed to goddesses, including the irish Macha, the welsh Rhiannon, and the gaulish Epona. Salmon: The Salmon was a sign of wisdom and appear fairly frequently in Fianna myths. Crows: Crows were often associated with the otherworld and often accompanied deities with strong majickal ties to the otherworld. Deer: The deer sometimes indicates the presence of an enterance into the Otherworld. She represents the unconditional faith and trust necessary to enter. Boars: The Boar represents fierceness, strength, boldness, and all qualities necessary for warriors and battle. He often represents those who partake in such events. Serpents and Dragons: The dragon and serpent represent the deepest inner abilities that we hold within ourselves. When Saint Padraig (Patrick) banished the serpents from Ireland, perhaps this is a metaphor for the banishing of the Druids. Cow: Cattle had various meanings from economic stature to fertility. Dogs: Dogs have always been an integral part of human companionship.